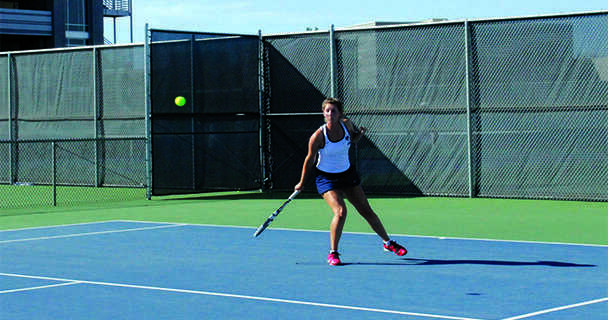 Kasha Lynhivue of the American River College women’s tennis team won in a match point ending 9-8 during singles competition, while the men’s team collectively won its match, scoring six points on each of their two-out-of three sets against Chabot College. ARC’s Joseph Capaul won 6-2 and 6-1 in his matches, while his partner from doubles Jimmy Giovannini won his singles matches 6-3 and 6-3. In doubles, both Capaul and Giovannini won their matches 8-3. Nick Cardoza, Nic Atkinson, and Dylan King also played well in their respective matches. Cardoza and Atkinson both won with scores of 6-2 and 6-4 in singles. King won his singles sets at 6-0 and 6-1. Coach Reed Stout and Coach Bo Jabery-Madison held a brief discussion during their teams’ doubles matches. “We were just talking about the matches and talking about how well the women’s (and men’s) team were doing. In doubles the guys are well trained, disciplined and are committed to playing,” said Jabery-Madison. Jabery-Madison entrusted a lot of belief that his team will come out on top during both doubles and singles, even though one player lost during singles competition. Ryan Wilson of the men’s team was the only person to be defeated on both sets at 7-5 and 6-3 during singles play. “The expectations I believe on doubles and singles is we will do the right things,” said Jabery-Madison. He did not comment on Wilson’s loss. The biggest match to be played was the finale for Lynhviue who’s match drew attention from coaches and players from all members of both the men’s and women’s tennis teams. “(Lynhivue) just played a career match to this point in her life. She did a great job of being steady in key moments … being composed under pressure definitely translated into other things (confidence),” said Stout. Lynhivue said she believed she played her best. “I feel like (my confidence) is getting there because I’m just a newbie playing tennis competitively, this is my first semester playing for ARC … Coach Stout gives me a lot of moral (support) whenever I play my game,” said Lynhivue. Lynhivue added that tennis is more than just a game of physical movement. “Tennis involves a lot of thinking about yourself, you use your brain a lot it’s not just your body. Stout and Huyen (Bui) help me out,” said Lynhivue. In her match, Lynhivue received admiration not only from her women teammates but Coach Bo Jabery-Madison men’s team too. “I love it (we are) just like a big family … it’s really nice to have the support from other people,” said Lynhviue. Be the first to comment on "Men’s tennis won 8-1, women’s won 5-4"